Wellington’s Richter City Roller Derby league’s home season final on Saturday 30 August will see Richter’s original home teams Smash Malice and Brutal Pageant meet in a final showdown for the first time since 2010, when the pink and red disgraced beauty queens of Pageant defeated leopard-clad Malice for a record-breaking audience of Wellington fans. 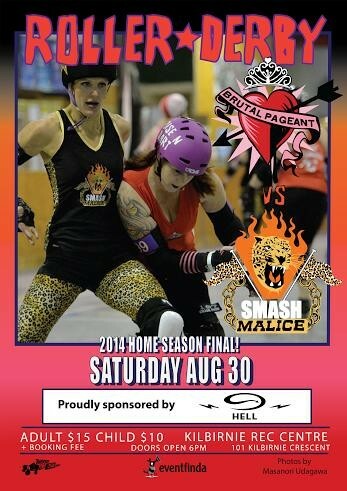 Brutal Pageant will be making their first appearance in a season final in four years, while Smash Malice will be looking to secure a championship title for the first time since 2011 – having lost hard-fought games to RCRD’s other home team Comic Slams in the 2012 and 2013 finals. With a more cosy and homegrown atmosphere than Richter’s former home TSB Arena, fans will have to get in quick for the limited number of seats available at new bouting venue Kilbirnie Rec Centre. Proudly sponsored by Hell Pizza. There will be snack pizzas for sale for $10 each, make sure you bring along some cash for pizza, raffles and merch! Come dressed to support your favourite team (Black and Leopard print for Smash Malice and Pink and Red for Brutal Pageant).